Have you been searching for that perfect hair style for the summer? Our stylists at Ramas Ohio Hair Braiding Salon can create your perfect look. Our Salon offers an exquisitely relaxing and warm environment for you to spend your appointment. We want the style that you choose to bring out the personality that does not aways shine through. You may have a short drive to our Indianapolis, IN location, but you will love your experience. Our clients enjoy spending the day in Indy going to the shops and restaurants before heading home. Your visit could take some time; therefore, get ready to sit back and relax with our amazing stylist. We take the time to give you the best results possible. 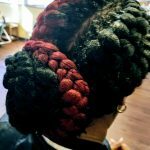 There is no better way to celebrate your natural beauty than with affordable braid styles. We can create your style with only your natural hair, or we can add extensions for length or fullness! Our stylists have experience with all hair types and ages. 2018 is the perfect year to express yourself. It is time to feel more empowered than ever! Like all of fashion, styles cycle back. The braided bun was primarily worn by older generations; however, it is cycling back onto the scene in 2018. This bun will be accented by micro braids with your large cornrows. This style continues to be a popular go to for African American hair. With this style, we recommend adding hair to give more length. 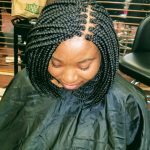 For individuals with short natural hair, large braids can slip out or cause too much breakage. It is important to choose a style that will not cause damage to your hair. These cornrows are great for softening a causal updo. Hairstyles can feel heavy or too much when it comes to individual plaits. Your braids can come in a wide variety of sizes and colors. You can even add accessories for a more stylish look. This is a great alternative with a lot of flare! 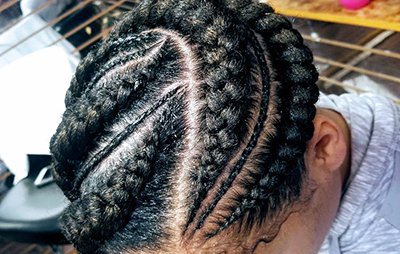 Cornrows are often styled straight back. 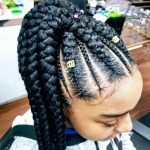 This is a very simple pattern and great if you are need to braiding. This style does not take long to complete. If you want to soft the look, you can ask our stylists for a wavy part to create a wavy look. I am sure you have seen the recent trend of shaving the sides or your head. If it seems like too much commitment to you, we have an option for you! 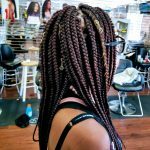 There are many ways that we can create your faux hauk, whether it is individual braids, twists, or even cornrows! This style is very protective for your hair. This style can be completed on almost any texture and length of hair. This style is quickly put together with a large braids that are wrapped around your crown to give a polished look. For women, long flowing hair has always been a signature look. These long braids can range between twists to free-flowing braids. You an even add accessories to individual braids to give your hair even more personalized style. You can create this personalized look with a wide variety of styles, colors, accessories, and sizes. For an effortless style, with years of class, you can style your braids into a half-up do. This look can either be sporty, casual, or even classy paired with the right outfit. This is a great every day style. This style is great for the women is always running out of the door with no extra time to spend on her hair. IT is a polished look that will work perfectly with thin, thick, or even medium braids. This style is hot for 2018. These twists are easy to achieve and give you a flawless look. This style is protective for fragile hair. 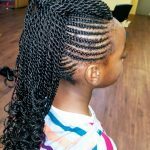 Have you been looking for the perfect African American braiding salon to achieve your dream look. Contact us, and bring in an image of your favorite style, and we will make it become a reality. We also start our appointments with a consultation about your hair health and up keep. We want you leaving with no regrets, that is why we offer a guarantee that your hair will not fall out of its braids within the first 3 days. If it does or you do not like your style, come back in and we will fix it for you at no charge! We are excited to hear from you!